I love this movie. It is one of my favorite movies of all time, but there are quite a few things I find in it that make me wish it were different. Of course everyone and their mother will gripe about not having Hey You as a main part of the movie, or that the musical arrangements are a bit of a perversion from the classic album sounds. I'll even admit that the movie version of Mother is downright shameful compared to the album version, but in all, the music is quite good and tends to follow the album. There are some additions, such as The Final Cut track: When The Tigers Broke free, and another song What Shall We do Now. The pictures added to the album make for a very overpowering and emotional experience. Highlights for me would be One of my turns, ABITW Pts I-III, don't leave me now, and comfortably numb. I am unable to award this five stars due to the few major flaws in fluidity and comparison (and Bob Geldof's vocals. Although his impassioned acting makes up for that, a bit.) 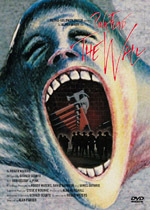 I can heartily recommend this to any Pink Floyd fan, or lover of dark movies. Four very solid stars.